As you can see, the temple is no more … It was dismantled to satisfy an idea I had to turn the space into an outdoor dining room. Keeping the window-gates as backdrop, I used their dimensions as guide for a new poured concrete pad that would form the floor of the room. 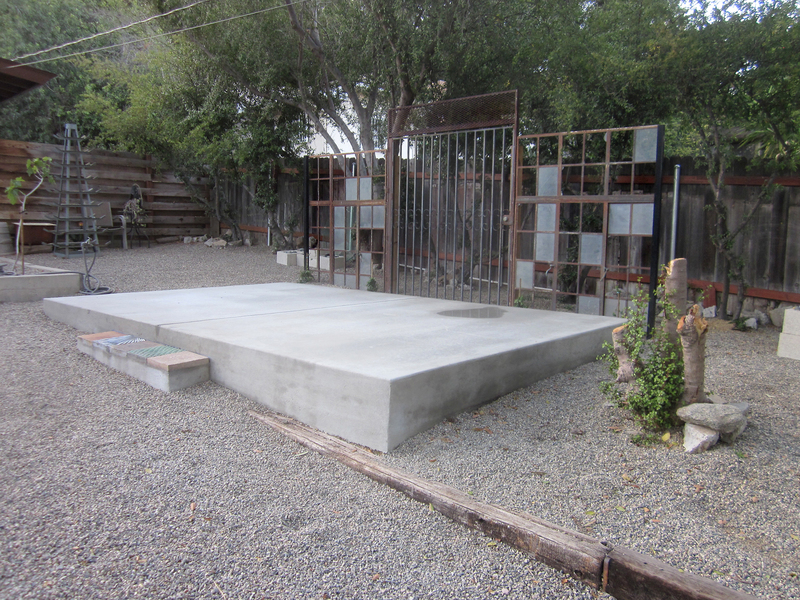 Now that the pad’s poured and fully cured, it feels quite ample and appropriately ‘roomy’. Using a variety of industrial furniture pieces, I’ve dressed it several ways as a dining room … and, now I’ve changed my mind. Exercising my prerogative as designer I’ve now decided the pad should be used as a lounge space; a lounge space that will include a water feature, a mural, and the softening effect of a green wall and succulents, both in-ground and in planters. The dining room? That’ll go outside the kitchen (duh!) on the deck there. 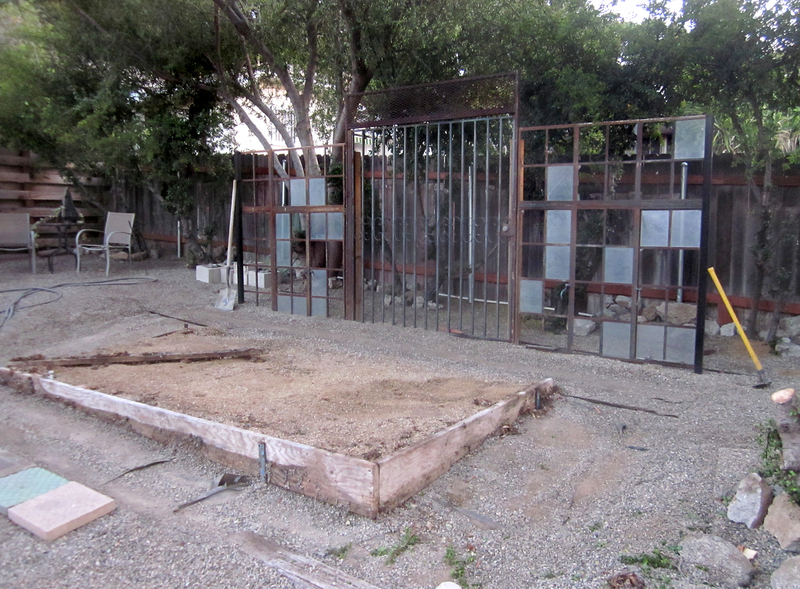 To that end, I’ve removed a former privacy screen to open up that area; the screen’s wooden boards will be recycled for another use … more on that later. 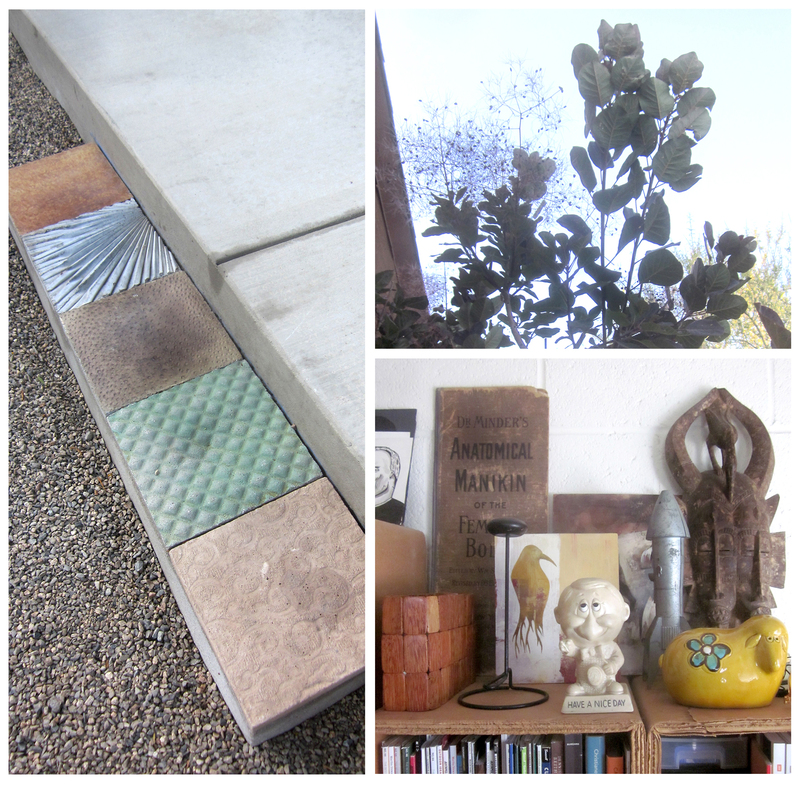 The step-up to the pad features handmade textured and colored concrete stepping stones by fellow garden designer/blogger Dustin Gimbel … that’s them in the first photo in this post. Love ’em, and love their new permanent home! That’s big project No. 1. Project No. 2 was obtaining, and planting at the Rancho, a long-coveted smoke tree. 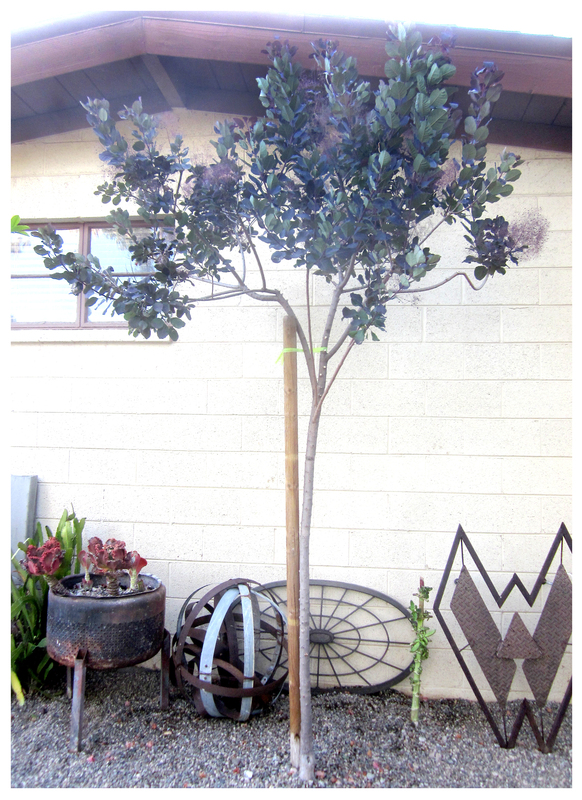 We chose the purple-leafed variety of this gorgeous tree-shrub, and this one is perfect. Doesn’t it go great with rusted metal? No. 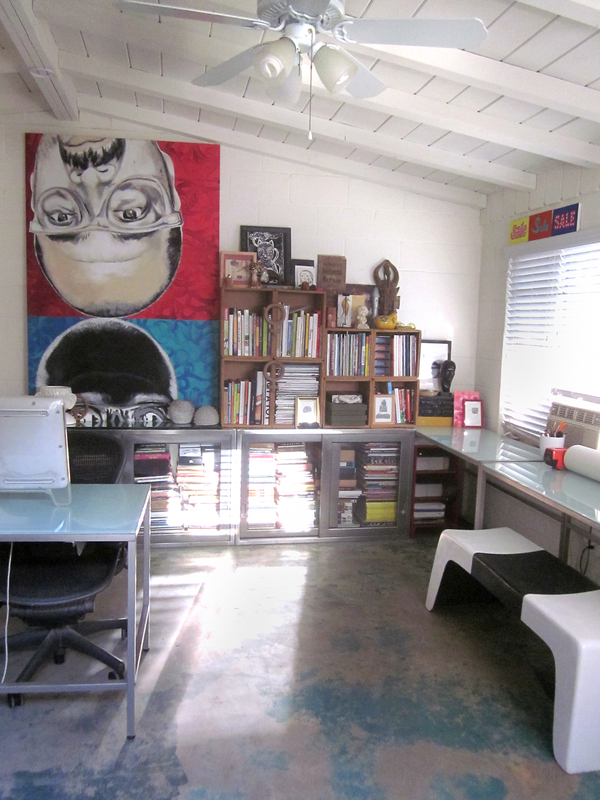 3 is the most personal: Organizing my office. For awhile now I’ve neglected this important space, allowing it to become so cluttered and messy I could hardly think, let alone, work there. Spending most of this past Monday there, I finally got it together … even adding a huge self-portrait that was languishing unseen in the garage. Getting these three projects to their current stages of completion required focused attention, and, most importantly, time … but they’re far from finished, and will required even more of both to take them to their logical — successful — conclusions … I’ll have to work on coming up with more of both those important commodities! Where, might one inquire, did you get the “long-coveted smoke tree,” and what size is it? Thanks for your great blog! 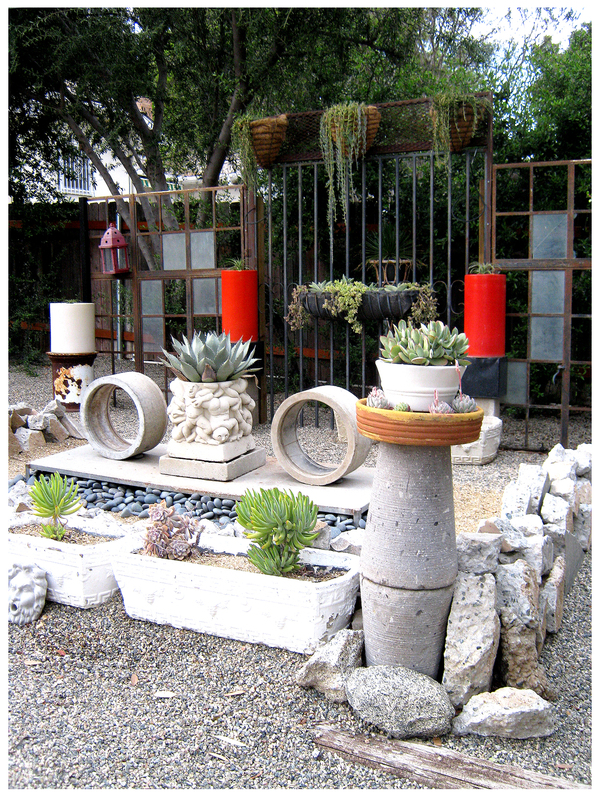 From local Paradise Nursery … they’re terrific! Find them at 7109 Dufferin Avenue Riverside, CA 92504; (951) 789-0386. The tree is at least 8-9 feet tall. Wow…no laying around relaxing for you! Currently, no … gotta keep moving! Exciting stuff — I’ve got a crete project in mind too but need to find those same important commodities! It took months, Denise, for all the planets to align so that we could get this done … and now I’m crazed to move on to the next step, if you couldn’t tell! Ok well I saw Big Reefer when I read the title of this post. Wasn’t sure what I would see when I opened it ! Well, I hope you weren’t disappointed, ks!